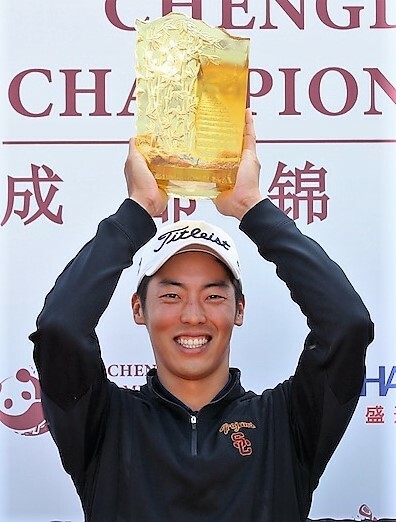 CHENGDU, SICHUAN, CHINA—USA’s Jeffrey Kang shot an 8-under 64 – his second in three days – to secure a five-shot victory at the RMB 1. 5 million Chengdu Championship, the opening event on this season’s PGA TOUR Series-China. Bouncing back from an opening 74, Kang posted a 20-under total of 268 at Luxehills International Country Club after shooting 22-under in his last 54 holes (64-66-64). The Los Angeles-born 26-year-old, who speaks English and Korean, finished five clear of English duo Callum Tarren (69) and William Harrold (67), and South Korea-born American Sejun Yoon (68). Hong Kong’s Shunyat “Jason” Hak, leader for the first three rounds, carded a 73 to share fifth place with China’s Daxing Jin (69) and Japan’s Kenta Konishi (69) on 14-under. Every tournament on this year’s PGA TOUR Series-China offers RMB 1.5 million, a 25-percent increase over purse levels from 2016. The first eight of 14 tournaments have been confirmed, with next week’s Chongqing Championship followed by two events in May, two in June and at least two in July.